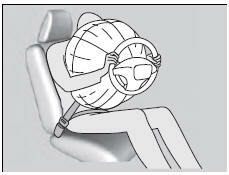 During a frontal crash severe enough to cause one or both front airbags to deploy, the airbags can inflate at different rates, depending on the severity of the crash, whether the seat belts are latched, and/or other factors. Frontal airbags are designed to supplement the seat belts to help reduce the likelihood of head and chest injuries in frontal crashes. A frontal collision can be either head-on or angled between two vehicles, or when a vehicle crashes into a stationary object, such as a concrete wall.While your seat belt restrains your torso, the front airbag provides supplemental protection for your head and chest. Side impacts: Front airbags can provide protection when a sudden deceleration causes a driver or front passenger to move toward the front of the vehicle. 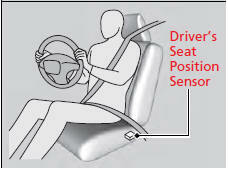 Side airbags and side curtain airbags have been specifically designed to help reduce the severity of injuries that can occur during a moderate-to-severe side impact which can cause the driver or passenger to move toward the side of the vehicle. Although we recommend against carrying an infant or small child in front, if the sensors detect the weight of a child (up to about 65 lbs or 29 kg), the system will automatically turn off the passenger’s front airbag. • Do not place any cover over the passenger’s side dashboard. Make sure the floor mat behind the front passenger's seat is hooked to the floor mat anchor. 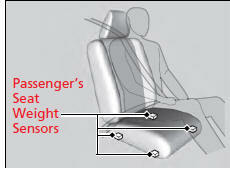 An improperly placed mat can interfere with the advanced airbag sensors.